The team of the Faculty of Construction took first place at the Festival of Amateur Creativity of Students Student Spring – 2018. 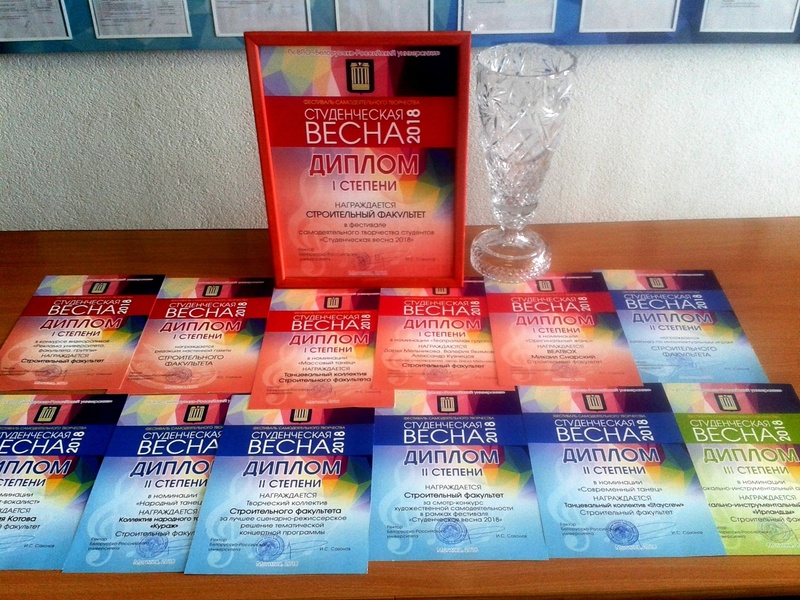 •The second place diplomas were given to Anastasiya Kotova for the best and direction solution of the thematic concert program and in the category ‘Solo Singer’, to the dance group ‘Staycrew’ in the category ‘Modern Dance’, to the folk dance group ‘Courage’ in the category ‘Folk Dance’. •The music group ‘The Irish’ was awarded the third place diploma in the category ‘Music Group’. The Faculty’s team was awarded the second place diploma in the University Amateur Talent Contest. The editorial board of the Faculty’s wall newspaper was awarded the first place diploma in the University Wall Newspaper Competition. The Faculty’s KVN team (Club of the Cheerful and Sharp-Witted) won the first place diploma in the competition of the University’s KVN teams. The Faculty’s team was awarded the second place diploma in the Mind Games Competition. The Construction students were awarded the first place diplomas in the Poster Contest dedicated to a healthy lifestyle. We congratulate the winners and wish them inspiration and every success in their creative endeavors!